Light tank has been so modified that it becomes a land dread-naught, many times as destructive as the ordinary tank. 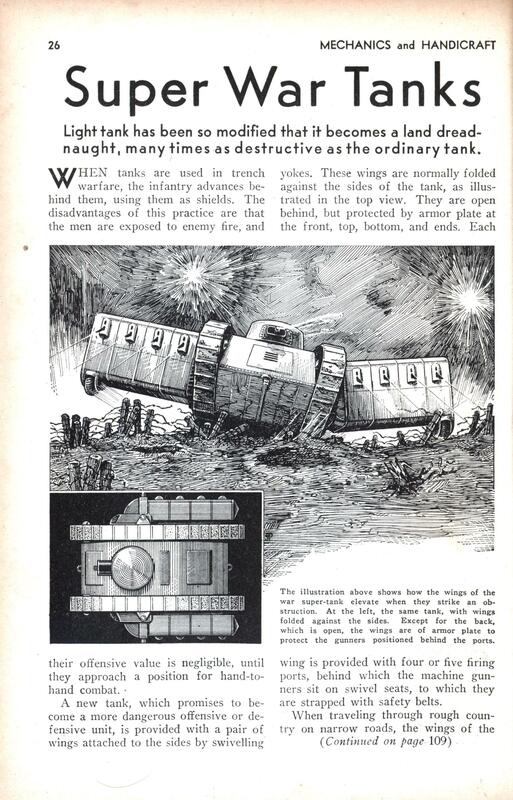 WHEN tanks are used in trench warfare, the infantry advances behind them, using them as shields. The disadvantages of this practice are that the men are exposed to enemy fire, and their offensive value is negligible, until they approach a position for hand-to-hand combat. A new tank, which promises to become a more dangerous offensive or defensive unit, is provided with a pair of wings attached to the sides by swivelling yokes. These wings are normally folded against the sides of the tank, as illustrated in the top view. They are open behind, but protected by armor plate at the front, top, bottom, and ends. Each wing is provided with four or five firing ports, behind which the machine gunners sit on swivel seats, to which they are strapped with safety belts. When traveling through rough country on narrow roads, the wings of the tank are folded against the sides, which operation is accomplished through gears, driven by the tank’s motor. When ready for action, the wings are spread out as shown in the larger picture. Each wing is fitted with a bullet-proof rubber tire and the flexible hinged joint permits the tank to travel over very uneven roads without damaging the lateral structures. It has also been proposed to fit the lower edges of the wings with power nippers, to cut through barbed wire entanglements, thus opening a wider path through which infantry can follow. The open back of each wing permits the machine gunners to drop to the ground and charge the enemy at the opportune moment. This tank, designed by Joseph Pignone, is to be submitted to the U.S. government. Thank you for posting this. I’ve been looking forward to it since you first took an excerpt from this issue several months ago. 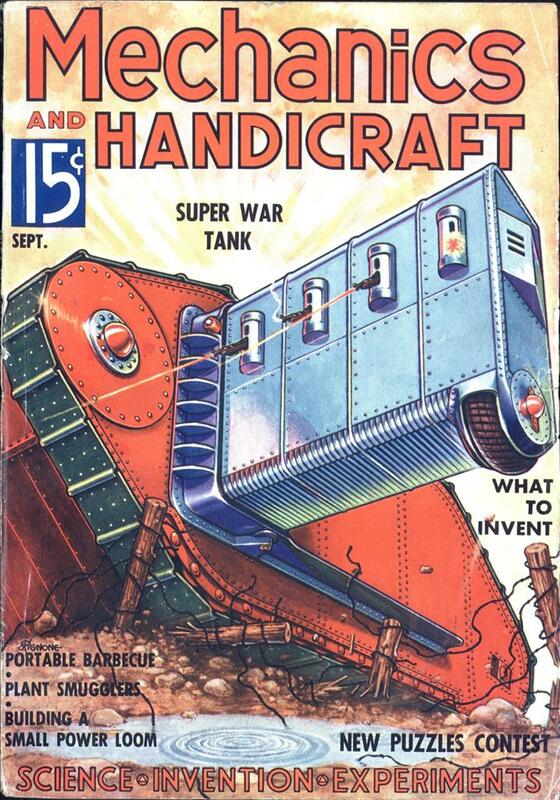 It’s amazing the ideas people had of what a future war would be like just 3 years prior to WWII. Thank you for posting this. I’ve been looking forward to it since you started into this volume several months ago. Like Hir says, amazing how late this idea held sway, but it’s the Maginot Line mentality. We were expecting another war of trenches, fortifications, and well-defined front lines, where this might have been at least worthy of testing out. Hugely impractical Zepp, Those wings make it a huge target and more added weight for not that much improvement (and would have to be lightly armoured as well). Heck with the ‘wings’ deployed, it’s going to snag any obstruction unless you manage to find a flat chunk of land (which wouldn’t exist in a trench-warfare style battle). I’m not sure what the advantages of the ‘wings’ are compared to simply having a side firing cupola that existed on the original tank. The design seems to me to be the product of someone who hasn’t seen a tank since the Great War. All the inter-war tanks have already dropped the oversized track design in favour of the more conventional ones we get in WWII. It seems that most of the great powers had toyed around with multi-turret tanks (like the T-28) before concluding those extra MG’s and men just added weight with little added combat efficiency.